Connect with us on Facebook or Pinterest for all our latest freebies & activities! We wanted to make something different for Halloween this year. We've done bats and ghosts and pumpkins -- lots of pumpkins! So this Halloween, I decided to try some Mummy Garland! I love it because it involves folding, tracing, cutting and creating -- perfect for kids of all ages with lots of ways to practice fine motor skills. 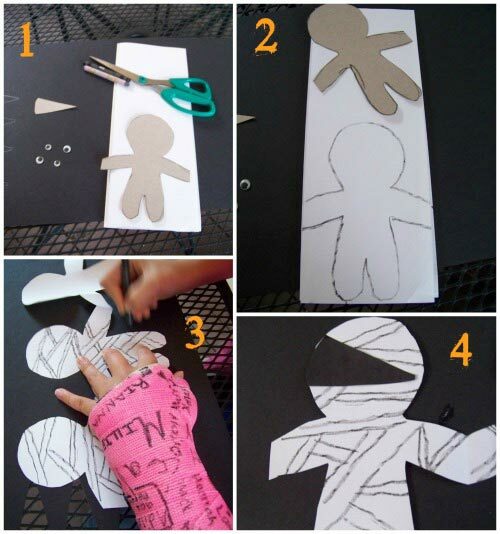 And it can be customize too -- make a mummy for each of your family members (even your Daddy ;) or make a long garland to use as a countdown to Halloween! This is a super easy craft and kids should be able to manage most of the steps with just a little guidance. 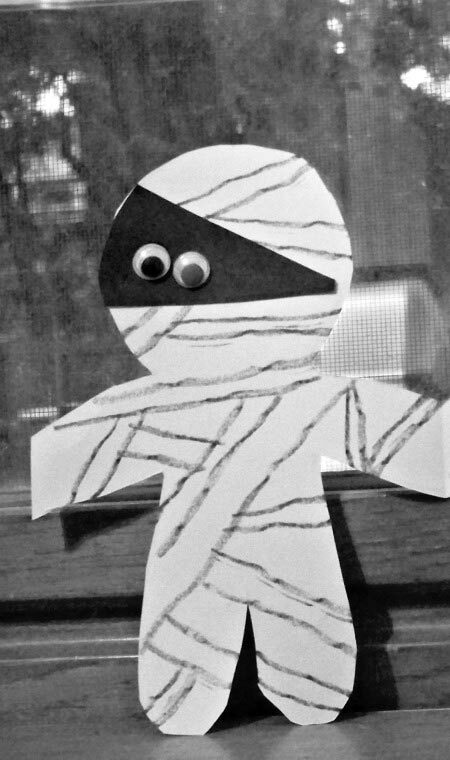 Kids can use a crayon, pencil or even black marker to draw parallel lines is a variety of directions across their mummy. It's great for writing practice and to help hone those fine motor skills. 2. Fold the while paper accordian style so that it's evenly folded and wide enough for your mummy template. Trace the mummy template onto the white paper -- IMPORTANT: make sure the arms overlap both edges of the paper -- this will allow you to unfold the garland. Also trace the triangle template on black paper (one for each mummy you will have on the garland). 3. Cut out your mummy garland and the black triangle eye areas. Unfold and draw pairs of parallel lines across each mummy so it looks like mummy wrapping. Kids can get creative with this as each pattern can be different. Ta-da! 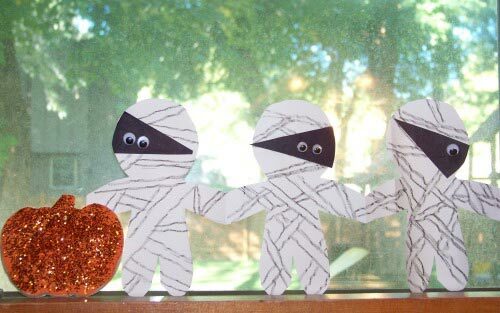 Cute little mummies to decorate your windows! And what's a craft without a fun book to pair with it! Here are a few great mummy reads that are not too creepy for the kids -- I've included affiliate links so you can read more about each of our selections. Baby Mummy is stalling at bedtime -- just one more game of hide-and-seek! But when he hears scary sounds and can't find Mommy Mummy, he starts to get a little scared. A wonderful book about those who help you overcome fears. Perfect for kids ages 3 - 7 years. After daydreaming about Ancient Egypt, our favorite cat is off on another adventure! Skippy's imagination takes him off to the underground tombs on Mexico with some laughs and Spanish phrases. A great book for kids ages 4 - 12 years. The pint-sized detective, Jigsaw Jones, & his friend Mia are off to solve the case of the mummy at the school party. Is it the REAL mummy everyone is talking about? Lots of Halloween fun in this story for kids ages 6 - 10 years old. One of the famous Boxcar Children mysteries! The kids are helping the museum curator to set up a new exhibit for a 4,000 year old mummy that will be on display. But once it arrives, nothing seems to go right -- is there a curse? A great read for mystery lovers ages 7 - 11 years old! 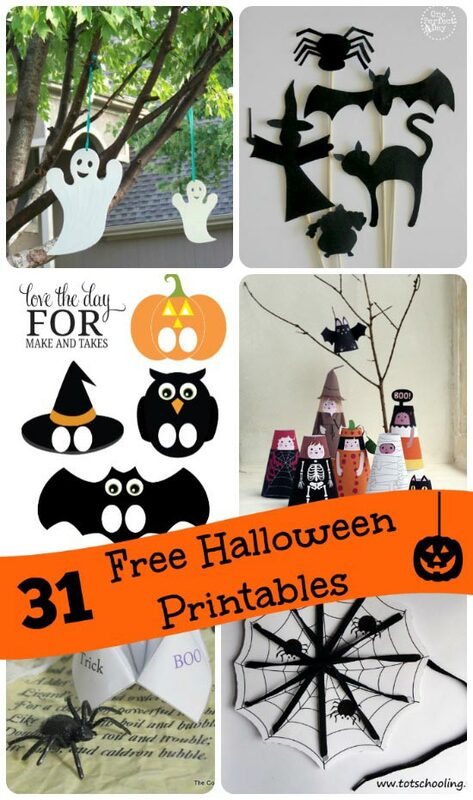 It's such a fun time of the year to try new crafts & activities! I love your mummies. This is such a cute idea! Ooh, this is fun! Thanks for sharing it with Afterschool, I'll include your craft in my host round up next week! How super cute! I love these little mummies. I've featured you at this week's Pinning for Play link party! Thanks for linking up with us. So cute !! I love projects like this that can be a keepsake, and provides a great way to document growth. So much fun to look back each year and compare how each child has grown. Thanks for sharing.